Whether youre faced with the needs of an aging parent, a critically ill spouse, or a developmentally impaired child, caring for your loved one is both a tremendous challenge and a unique opportunity to grow in the image of Christ. Shelly Beach takes you beyond knowledge and hands-on resources to the emotional and spiritual realities of caregiving. With humor and hard-won insight, she shares wisdom, inspiration, and encouragement from Gods Word. 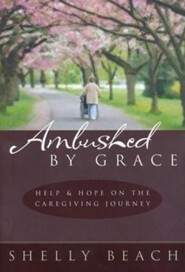 This book will sustain you on your journey as a caregiver, and open your eyes to the life-changing transformation that awaits you on the way. Shelly Beach is a freelance writer, public speaker, and author of Ambushed By Grace; Precious Lord, Take My Hand; and the 2008 Christy Award-winning novel, Hallie's Heart. She is the founder of the Cedar Falls Christian Writers' Workshop in Cedar Falls, Iowa. Shelly and her husband, Dan, have two children and live in Sparta, Michigan. I'm the author/artist and I want to review Ambushed by Grace: Help and Hope on the Caregiving Journey - eBook.